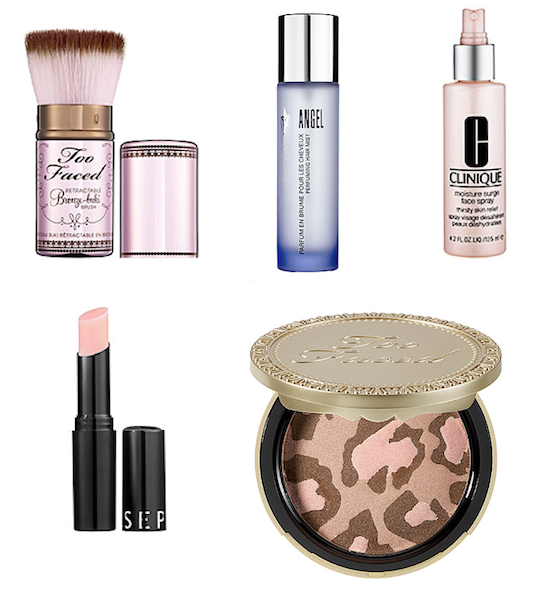 Last week, I waltzed into Sephora in need of a new bronzer, and some sort of beauty change up for summer. Like the proverbial kid in the candy store, I left with much more. The bronzing powder was purchased (and it’s just the hint of warmth and pink I was looking for) along with a new bronzing powder brush (naturally!). And, because the sales lady that helped me smelled so great, I had to ask what scent she was wearing…apparently, it wasn’t perfume at all, but rather Angel Hair Mist! Then, to figuratively seal the literal deal, she also recommended Clinique’s moisture surge face spray. I’m probably using it all wrong, but a few spritzes of this stuff, seems like a fun way to get your skin hydrated quickly. Finally, even though the last thing I needed was another lip balm (I seriously have some sort of lip gloss/balm hoarding issue) I couldn’t resist this one by Sephora. It claims to match your skin’s ph balance or something like that, creating a perfect pink just for you. How would you ever even know if this is true?! At any rate, I really do like the color on me. Do you switch things up in your makeup for summer or are you true to the same routine all year long? That lip balm sounds cool. I wonder how it works. I think Dior has something similar. It sounds like a great idea. Hi Sue, a very nice assortment! I wear Angel and do not have the Hair Mist….a wonderful Birthday Gift, hint, hint! I have heard of different makeups and lipsticks doing this, they must be totally chemistry laboratory projects for the company! Love all those products! Especially the bronzer! Happy Fourth weekend! Love following your blog! I need that powder blush!! Love the packaging! I hope you all had a wonderful weekend!